I’m proud to say that the worlds best walnuts come from California. I moved to California for its sun and their, well uhmm, nuts ;-). (Californian) walnuts contain lots of Omega 3. They contain two times more then, for instance, salmon. One hand of walnuts a day is enough for your daily dosis Omega 3. There is only one food in the world that contains more Omega 3 and that would be Flax Seeds (we will discuss it in the near future, so bookmark us!). Omega 3 fats are beneficial for the membranes of your skin cells and they keep out toxins that can damage skin cells. Your skin will be moisturized from the inside out. But the biggest secret of Walnuts is that they provide an extremely high level of Vitamin E in the form of γ-Tocopherol (or gamma-tocopherol), which is an underestimated member of the vitamin E family. In 2006 a study was published about gamma-tocopherol*. The study explained that this Vitamine E prevents skin pigmentation. Other benefits of walnuts are; Benefits in Treatment of Type 2 Diabetes, lower risk of chronic oxidative stress, anti-inflammatory, support of weight loss (I could’t find hard prove for this). Reduce Problems in Metabolic Syndrome (MetS). NOTE: Some magazines and/or websites will tell you to remove the thin skin of a walnut, because it tastes better. 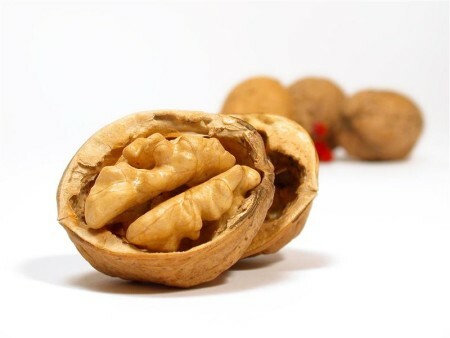 Never remove the thin skin of a walnut, although it’s bitter, 90% of the phenols in walnuts are found in the skin, including key phenolic acids, tannins, and flavonoids!